G Suite (formally Google Apps), it’s not only a robust email solution, but includes a suite of Google services that can help your team communicate and collaborate more easily. Google used to offer a free edition of the Google Apps service with a limit of 10-10000 users for the account – perfect for some small businesses. As of December 6, 2012, however, Google stopped offering the free edition. Paying for Google Apps, in our opinion, is still well worth the price, but at $50 per user per year, a free account using all of its available user accounts could save you $500 annually. Yes, the paid version of Google Apps offers more features and support, but the free version is no slouch. At here, I’m not trying to sell you on Google Apps right now (of course you can get on at my site ggappsfree.com) – I’m trying to let you know that if you’re one of the lucky businesses to have a free Google Apps account, you should make sure not to lose that resource! 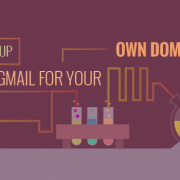 How do you get Google Apps for free? Point being, if you’re lucky enough to still have one of the free accounts – and users of the free edition will be allowed to continue to use it for free as long as the account is active – you want to be sure not to lose that valuable resource! If not, you can buy one here at the cheapest price. Recently, Google began closing inactive free edition accounts. The reason Google gives for this is that some users have been unable to sign up for a new account because an old, inactive account still existed that was associated with their domain. Whatever their reason(s), this move shouldn’t surprise anyone – of course Google would prefer to sign up new paid accounts. The fact that businesses that still have old free edition accounts are allowed to continue using it for free, and are not forced to migrate to the paid edition, is a good thing, but no one should be shocked that Google would want to clear out accounts that aren’t being utilized. 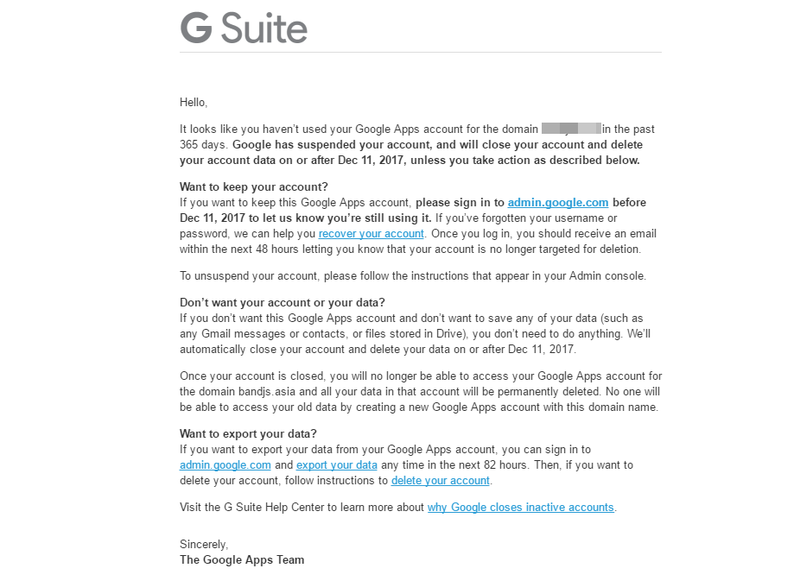 If you do have a free edition Google Apps account and this information comes as news to you, maybe you haven’t been paying attention to that account at all – or maybe you’ve been using it regularly and so haven’t received any inactivity notices, in which case you don’t need to be concerned about this! If you fall into the former category, perhaps Google Apps simply isn’t a tool that fits your business’s needs, and you’re perfectly fine with letting it go. Just make sure that you’re making an informed decision about it rather than losing out on a resource simply because you didn’t realize what you had. If you do receive an inactivity notice from Google, all you need to do is log in to that account in order to reset the inactivity counter. Better to go ahead and take just a minute to refresh your account than to wish you had later on! If you’ve forgotten your username or password, we can help you recover your account. Once you log in, you should receive an email within the next 48 hours letting you know that your account is no longer targeted for deletion. 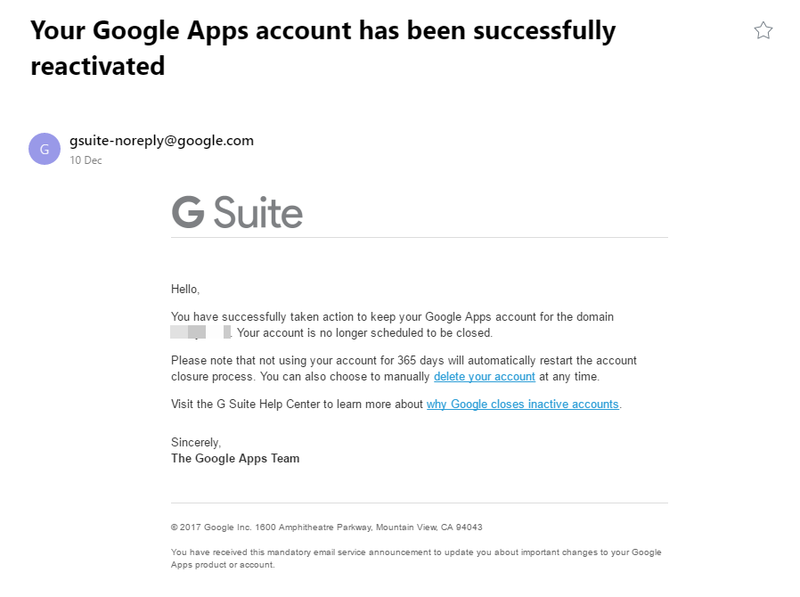 That means your Google Apps account has been successfully reactivated. If you don’t log in for 30 days after receiving the notice, your account will be closed, and the only way to reactivate it will be to purchase a paid account. At this point you will have access to the data on your account for 30 days before the account is completely terminated – if you’ve used your account at any point, you’ll want to be very careful about this, because once the account is terminated, your data will be irretrievable! This includes email, contacts, any files stored on Drive, etc. If you do decide to let your free account go, it would be a good idea to make sure the account isn’t holding any data that you might need later before it’s gone forever! If you do use your account, even if you don’t use it heavily, this probably won’t ever become an issue for you – the accounts currently being targeted for closure are accounts that haven’t been used at all in over a year. If you have to stop and think about whether it’s been that long since you’ve used your free account, it’s probably time to make a decision about whether to keep that account! Whether you decide to keep it or to let it go, just make certain that you’re planning for the situation, and not letting it take you by surprise!